"Daryl Weber’s Brand Seduction is jam-packed with fascinating research and actionable insights. Weber shares the science of decision-making simply and clearly, which makes his book perfect for marketing practitioners, academics, and consumers alike. If you’re fascinated by what makes consumers tick, this book’s for you." For many marketing professionals, “science” is a four-letter word. They see brand-building as an unteachable art guided by their intuition and experience. But at its core, marketing aims to seed ideas into people’s minds, make them feel a certain way, and, ultimately, get them to act. In Brand Seduction, Daryl reveals the latest psychological and neuroscientific discoveries about how our minds process brand information and make decisions, and the important roles our emotions and unconscious play in our selections. Welcome to the new world of neuromarketing. The surprising unconscious side of brands. The biggest myths about consumer psychology. The real role of emotions in building brands. Practical tools to use neuroscience to inspire better marketing. Everyone seems to have a different idea of what brands are, how they work, and how they are built. 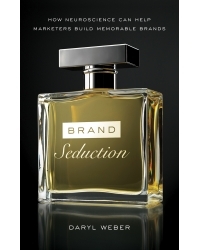 Brand Seduction digs deeper into the nature of brands, how they exist and behave in the mind, and how marketers and business leaders can use this understanding to “seduce” customers and grow their businesses. Daryl Weber is a branding consultant whose work has influenced many of the best and biggest brands in the world, including Coca-Cola, Nike, Johnnie Walker, Gatorade, Pampers, and many more. He was formerly Global Director of Creative Strategy at The Coca-Cola Company, where he oversaw brand and communication strategy for many of the company’s billion-dollar brands. Prior to that, he was a Director of Strategy at the consultancy Redscout, where he advised Fortune 500 companies on new product innovation and brand positioning. Weber has a BA in psychology from Columbia University. You can follow him on Twitter @BrandedCortex.